I have used the standard headphones for the XBOX 360 since launch, with no issues. Recently i sat on them, which did cause a bit of a permanent issue. I then used the ones that came with my slim HALO 360. These were fine to begin with, but everyone kept telling me i was breaking up, so the time was upon me to get some real gaming phones. Picked up the TBEF’s in Game – Westfield – Stratford for 59.99. They were a fiver more than the usual models as they were the COD MW3 special editions. I know, i just couldn’t help myself. Phones Unboxed. Nice military grey ! As you can see they come in a fetching military grey, with some MW3 insignia. Just right for all that MW3 TDM ! They also comes with a bundle of connectors including USB (longest lead ever, and no batteries kids) for power and some RCA jacks for sound. You will notice in the photo they also have a little in line controller. This covers independent chat and game volume, a stereo expander, the usual mic on and off, and an adjustable bass control. 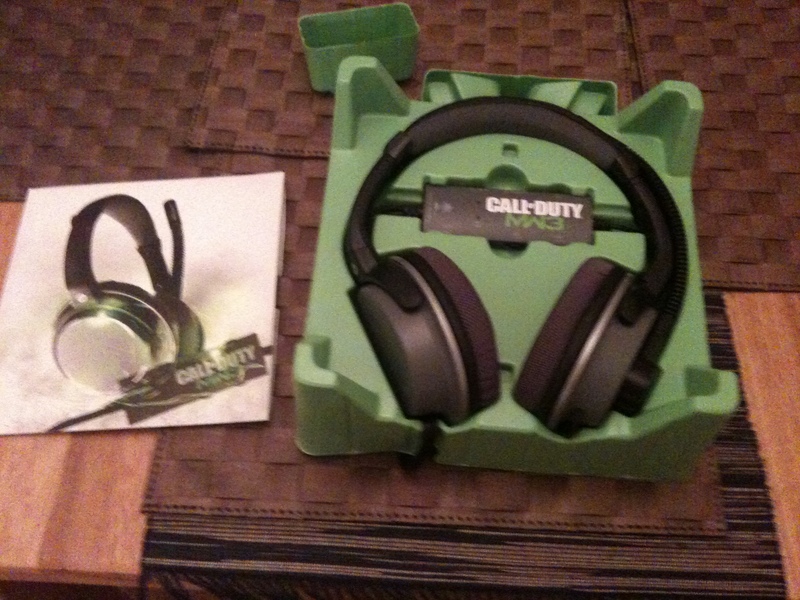 The sound quality is really good, and brings new reality to playing MW3. You can hear properly, things happening in all directions. For a gazillion pounds they do a Dolby 7.1 version that must be pretty special! The first thing you do need to do though is get used to balancing game and chat levels, else things just get loud and annoying. People screetching on game chat (you know who you are), can bring an unpleasant shock, but having the game in ear adds more than i could of imagined (Headphones are for DJing or Ipods only in my house up until yesterday). These fellows also work on PS3 and PC as well, and i really need to bring them to work for my next VOIP conference call, if only for the crack. Well worth the money. 4 MrBens.